* Our gorgeous Rose Gold Wedding Earrings boast pave Cubic Zirconia in unique concentric ovals. 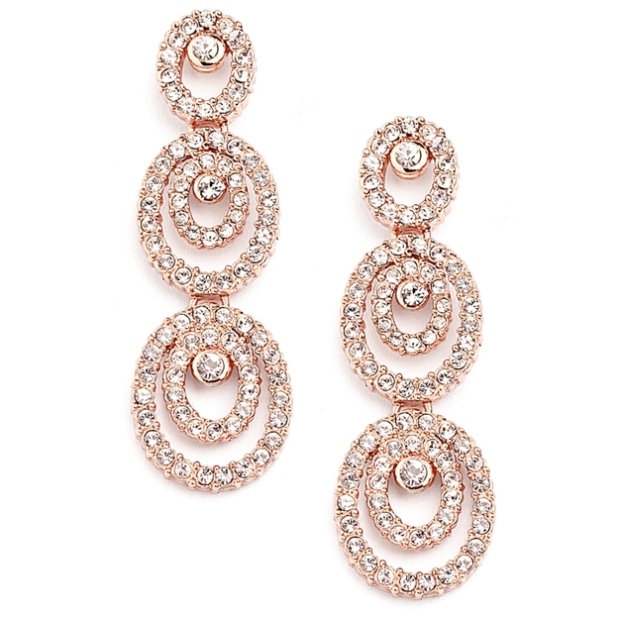 * Our 1 5/8" h x 1/2" w Bridal Earrings use top quality CZ's plated in ultra chic Rose Gold. * Get the look of Diamonds in Blush Gold at a fraction of the price! * Enhance your store's Wholesale Jewelry Collection with these stunning Rose Gold Wedding Earrings by Mariell. * Our contemporary dangle earrings have a unique 3-tiered design with concentric ovals and brilliant AAA quality Cubic Zirconia. * These best-selling earrings are also available in warm Gold as style 4066E-G or in Genuine Silver Rhodium as style 4066E-S.